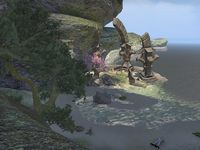 Heretic's Summons is a small camp located in central Auridon, north of the city of Skywatch. A predatory clannfear by the name of Snapjaw inhabits the camp. The stories of Snapjaw's activities are told by his various leftovers, including beached and sunken rowboats, scattered and broken possessions, and of course the corpses of his victims. A lit campfire can be found at the north end of the area amidst some partially buried ruins, possibly hinting at recent actions by the murderous clannfear. Near the campfire is a bedroll, a backpack, and a leveled pair of shoes. A little further south, an urn can be found between a ruined wall and column. Over in Snapjaw's area, among his refuse can be found six sacks. The beached rowboat has a backpack leaning against its side, and a leveled dagger can be found laying out in the open beach nearby. A chest may spawn a short distance southeast of the rowboat, up against a large, stone column.